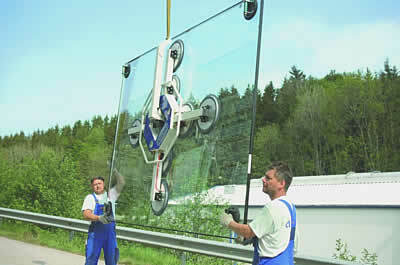 The VacuMaster Glass is the ideal solution for handling plates of glass in an outdoor environment. The lifting device is designed for use high above the ground using a site crane, and as such, the highest of safety precautions have been implemented. Utilising dual independent vacuum circuits, if one circuit fails, the second circuit is able to handle the maximum load alone. Each circuit has its own vacuum reservoir and manometer for displaying the vacuum level, and if the vacuum drops to a critical minimum level an audible and visible warning signal is produced. Using the VacuMaster Glass, workpieces can be swivelled manually by 90° and rotated continuously through 360°. These movements can be locked into place in 18° increments for swivelling, and 45° increments for rotation. The flexibility of the VacuMaster Glass allows the adaptation to workpieces of various sizes. The device’s extension arms can be easily removed, so the number of suction plates is appropriate for the load to carry. The two redundant vacuum circuits distribute the vacuum according to the number of suction plates, ensuring the glass can be handled safely at all times.